8 leaves : ; 28 cm. assignment and I am pleased to share their report with you. others will require some additional study and/or thought on how to implement. interesting idea and I am giving it serious consideration. The committee report identifies several activities to proactively facilitate improving the department's learning environment. Getting better acquainted is an important first step. To encourage this, I am initiating an activity I describe as "take a graduate student to lunch" where two or three faculty will treat two to three graduate students to lunch during which discussion will focus on getting acquainted and related light conversation. (Preferably, the faculty would not be the major professor or current teacher of the students going to lunch.) Alice has agreed to help organize this volunteer program. 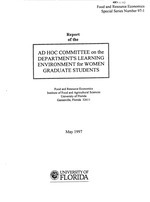 At the faculty information exchange on March 19, 1997, 1 reported that the WFAS Review Team had completed its assignment and appropriate actions taken. We have made a great deal of progress this past year. Individual attitudes are positive and constructive. There is still a great deal of work to be done and this report helps point the way. My thanks to the members of the committee for helping us understand how to proceed. The committee considers the task to include three components (viewed as a wheel in the figure below): (A) Learning, (B) Proactive and (C)CorrectionfPrevention. Correction (C), consisting of legal constraints and university policy concerning sexual harassment, is an essential core component (see page 2). The desire is that knowledge of strong corrective action, when people are well informed of the consequences of wrong behavior, will be a deterrent to sexual harassment. In the event of wrong behavior, quick and appropriate action is necessary for all concerned and will help restore confidence. interaction, 2. professionalism, 3. individual mentoring, and 4. community integration (see page 4). Each of these environments deals with tangible ways for a person to relate to the Department as a safe, comfortable learning environment. The desire is to move away from the need for corrective action and toward a proactive, safe and comfortable learning environment (A). Successful prevention will result from firm policy, effective education and meaningful interaction in the Food and Resource Economidcs Department. The Food and Resource Economics Department is committed to a learning environment free of sexual harassment; committed to preventing it; and committed to prompt remedial action consistent with federal and state law. complaints or discuss sexual harassment with faculty or male graduate students. be one where the investigation is completed within a week or two of the complaint. * Definition of sexual harassment. * Federal and state laws prohibiting sexual harassment.
" University procedures for handling complaints or alleged incidents. known of the harassment and takes no corrective action. * Corrective action can include dismissal of tenured faculty. * FR.E will seek prompt remedial action.
" Considering alternative ways of handling the risks. * Selecting the best alternative. * Conducting periodic evaluation and review. The committee identified four broad areas in which there need to be activities that will proactively facilitate improving the FRE learning environment. These four areas are (1) professional development, (2) mentoring, (3) community integration, and (4) social interaction. It is recognized that these four areas overlap; however, the essential components of each are discussed below. for graduate students as an integral part of the academic education. development activities to students' education and competitiveness on the job market. particularly valuable for courses in the graduate student's area of specialty. graduate students in general and doctoral students in particular. Include graduate student representatives at some departmental faculty meetings. increased awareness of the workings of FRED. students to work with them on projects. highlight current interests, working thought, or be a topical issue for conversation. graduate students who may have to perform this role in the future. competition, or working with the FRE Club on professional development activities. Objective: Introduce and integrate new students to the department. famidliarity will promote more productive interaction. incomidng students to three faculty. cooker, but a social midxer. academic setting so that they will feel comfortable with them. Have weekly coffee exchanges where graduate students are encouraged to attend. Keep area small and encourage interaction outside of usual contacts. Hold dinners at faculty houses with small groups of graduate students and faculty. First, we are very concerned about the time it is taking the University to settle the recent case. Soon we will be approaching one year since the women started to make the problem known. Not only is this a very long time for those directly involved and for the department in general, it speaks badly for building trust and confidence. The delay also furthers the risk of greater damage to the department and university. Our policy recommendation in the report emphasizes the need for speed. action might restore our image for prospective students and let all of us remain proud of FRED. We appreciate your leadership with this challenging task. ideas you may have. Your immediate task is to generate a set of doable actions and/or activities that the Department might implement to help create a positive environment for women students. and how we might implement them by the middle of April. you cannot attend the organizational meeting on March 11, please let Dr. Andrew or me know.